Have managed to get the roll pattern onto the stack but masking wasn’t that great and I’m not very happy with the result. The ribbing makes it quite difficult to get a nice tight fit on the tape and there has been a bit of spray got underneath. I have touched it up a bit but still not 100% happy with it. May need to think about re-masking or possibly using sheets to black decals (might be able to run a sheet through the printer to get a completely black decal). Working ever closer to the top!! Now reached as far as the Service Modules. 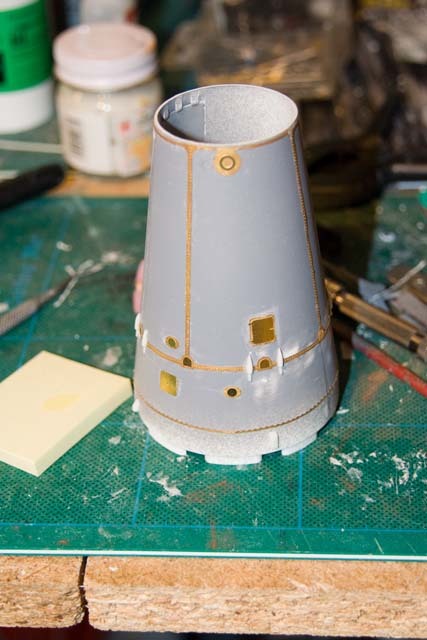 The one which comes with the kit is a Block 1 version (as explained in my previous post) and I had to sand off all the details which were moulded on. This was really confusing because the plastic retains the appearance of the moulding even after it has been sanded off. 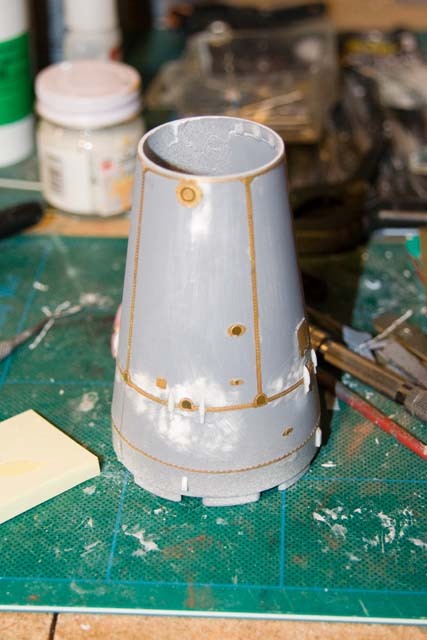 So it isn’t until you get a coat of primer onto it that you can really tell whether you have got a smooth surface or not. The radiator panels were added back from the New Ware photo-etch to represent the Block 2 version of the CM. The CM will get a coat of aluminium spray paint now and the radiators will be hand painted in with some white paint. So now seems an appropriate time to start masking up the rest of the stack to get a coat of black paint to form the roll pattern. 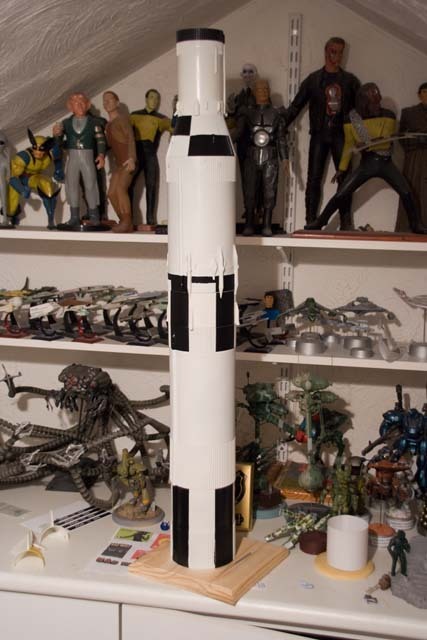 I have made a start on the first and second stage, and the interstage, masking it up with Tamiya tape. And watch the Revell instructions as they are wrong. The include a continuous black band around the bottom of S1 which doesn’t seem to be present in the real thing. The main parts of the stack will be masked with something a little cheaper (possibly some cling film or paper). Only a week to go until the deadline for the magazine article and as you can see there is still a heck of a lot to get finished. Some late evenings coming up I think! The SLA is a tricky bit because of the huge amount of photo etch and trying to get the four pieces which form the “petals” to line up. 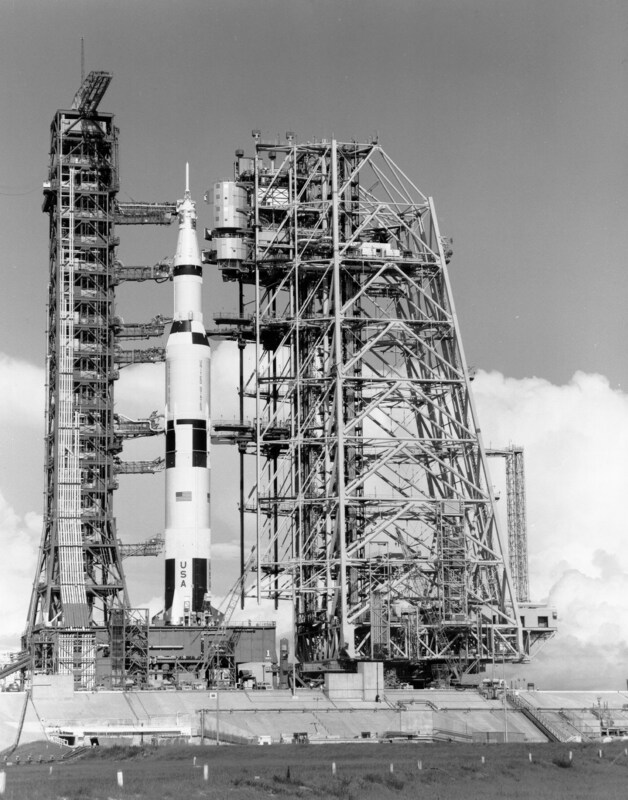 These would be the break lines when it opened to reveal the Lunar Exploration Module. Finally got there although there are still a few gaps around the photo etch where they didn’t get quite enough glue underneath them. This is a bit tricky to get quite right because you don’t want too much glue otherwise it will ooze out and need cleaning up and too little means a bit of a gap. The bottom section of this piece is actually the instrument unit (IU) which should really be a separate piece. I am leaving it attached (for the moment) so that the stack can be completed. As you may have read previously I am writing an article for a magazine based on this build and unfortunately due to changes in the publishing schedule I have lost 2 weeks of my build time. This means a change of plans for the article and I am going to complete the model as a full stack, at least initially. 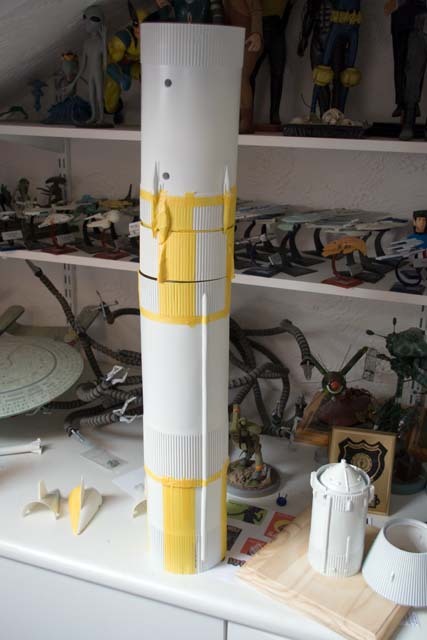 Once the article is complete I am going to revert to Plan A and go with the model on it’s side and in separate sections. Unfortunately I just don’t have the time available to complete it this way for the article though. Which is a great shame but it does make this a build of two parts. So I will be continuing onwards even after Plan B is complete. Working my way ever upwards we come next to the Service Module (SM). Unfortunately pretty much everything here is wrong. 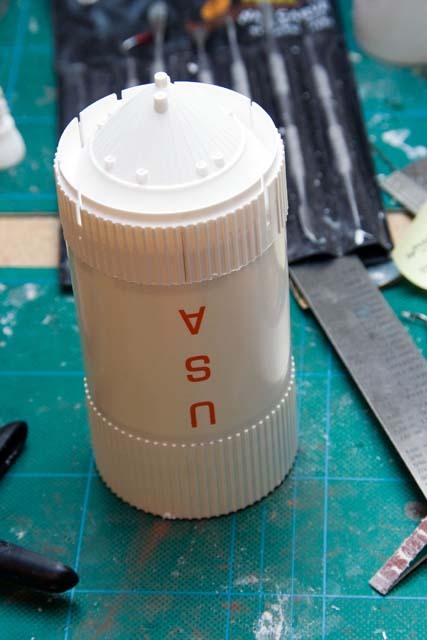 The model is based on the Block 1 version, which never actually flew and following the tragedy of Apollo 1 it was completely redesigned into the Block 2 version. So all the detail will need to be sanded away and more photo etch (I am really starting to dislike that stuff) will be added to replace the detailing with the correct details. 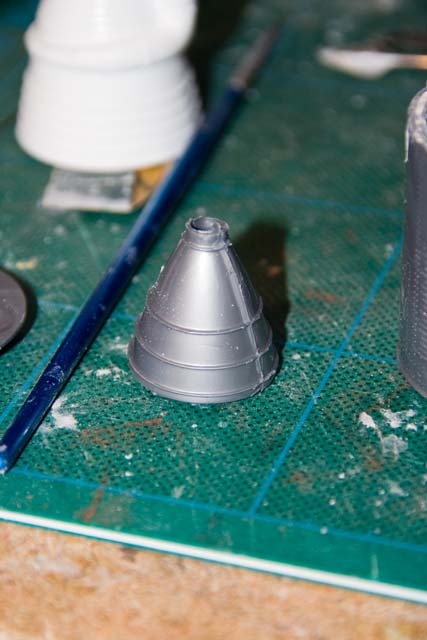 The nozzle on the SM is also wrong and it doesn’t have those rings, so they will need to be sanded off as well. 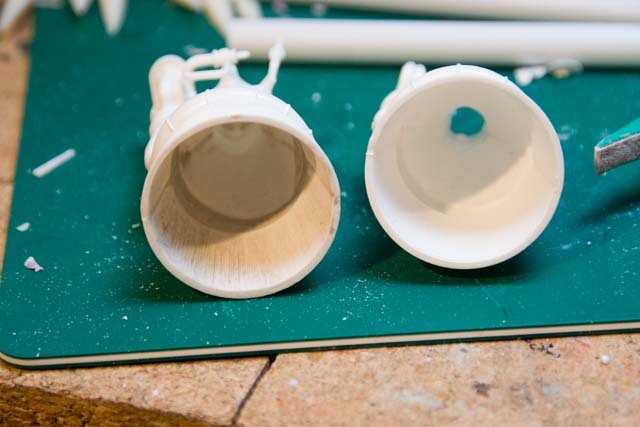 Wish someone would come up with a way of moulding nozzles in one piece so there isn’t a seam all the way round them, but particularly around the inside where you can’t really sand it clean. Well, still plugging away trying to get this done. Unfortunately a change in the publication schedule of the magazine which I am writing an article for based on this build means that I have had to revise my immediate plans to hit that, which has taken 2 full weeks out of my build time. So some things will be a bit different in that article to how they are in this blog and in my final display. 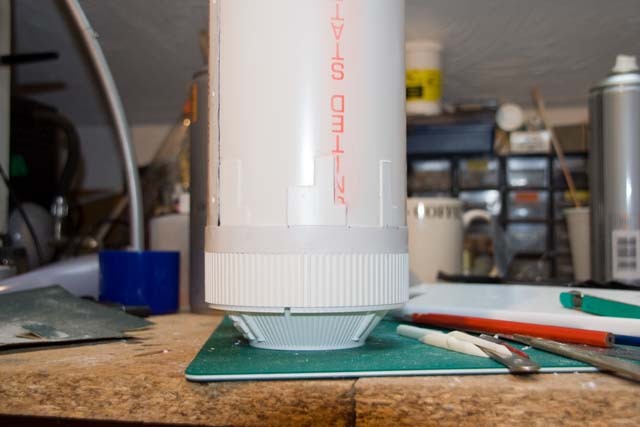 So it will be stack for the magazine and some of the engine details will not be completed. I will get back to them for the deadline for the SFM:uk “To the Moon” Build. So big target for this weekend was to work on the third stage (S-IV) and get that complete, which I think I have managed. 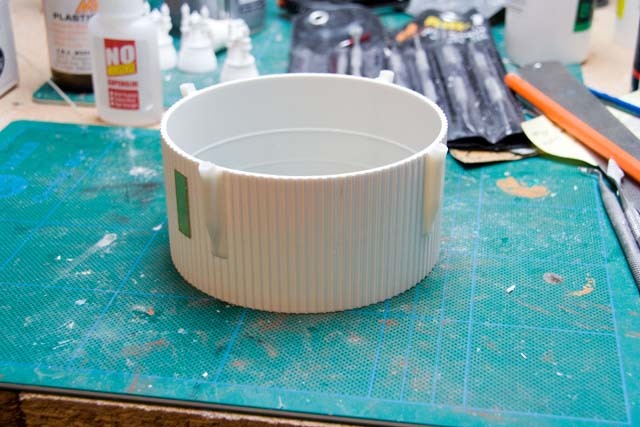 There are (for such a small piece) quite a number of resin parts to add to this. And a number of the stringers need to be cut short to accomodate them. Got a couple wrong (placing them on the top of the stringers) and when I went back to check they needed to be cut into them. This is the sort of silly errors you make when you try and work too quickly and don’t check beforehand. At least it was that way round and I didn’t have to try and repair the error. 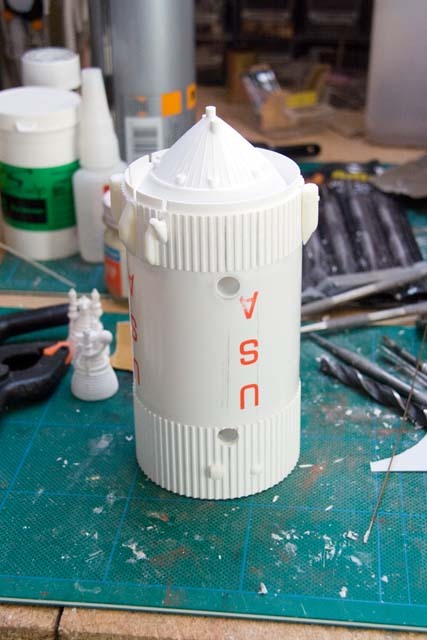 As I managed to get S-IV completed a bit quicker than planned I did manage to get on with the Saturn Lunar Module Adapter (SLA) which is the bit that house the LEM (Lunar Exploration Module). 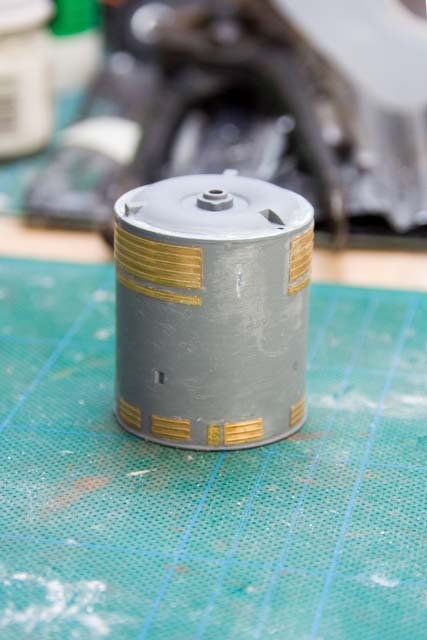 The Revell parts have one section which is clear, so you can see the folded up LEM inside the stack. Obviously that’s a bit naff and I wasn’t going to follow that. So the clear section was glued in, trying to get it as flush to the surface as possible, and then a little bit of putty added around the edges to blend it a bit better. A coat of primer revealed that I hadn’t got it quite right first time, and a little smear of Mr Dissolved Putty was added to fully blend it in. The bottom part of this section (the straight bit) is actually the instrument unit. In the final display this will be cut off and displayed separately but to complete the magazine article it is being left in place for the moment. Now nearly ready to start tackling the Service and Command Modules. Then at least the full stack will be completed. One slight annoyance is that the can of Renault Polar White I bought for the final white colour has a very distinct blue tinge to it, which means it’s no good for this build. Very annoying, as now I’ll have to try and find a pure white one. Still working on the second stage, but now on the bottom of it. 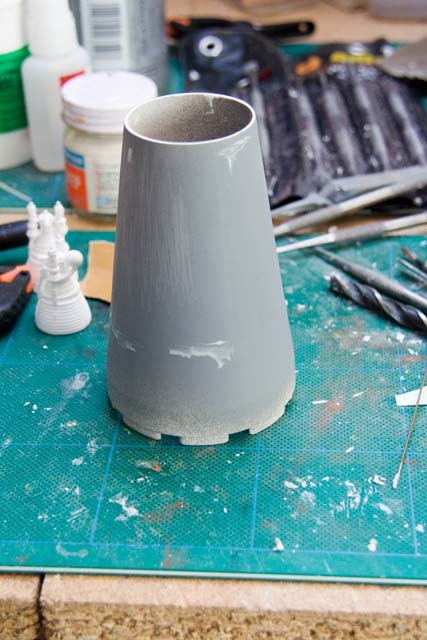 There are numerous additional resin parts to add around this area from the New Ware kit. I will need to check the information to work out what these actually are I’m afraid. But one thing that is reasonably clear is that even though this does add a lot of additional detail there are still a lot of details which are not represented, basically all that wiring you can see in the picture on the right, which is the Saturn V on display at the Kennedy Space Center. 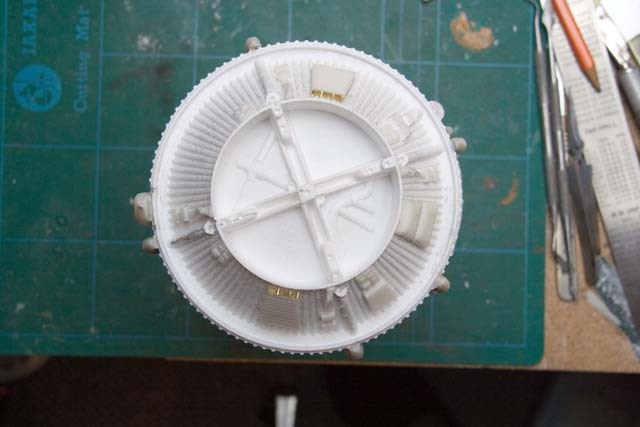 There is also a ring around the bottom of the stage that is punctuated with holes which is not represented in either the Revell kit or the New Ware add on parts. 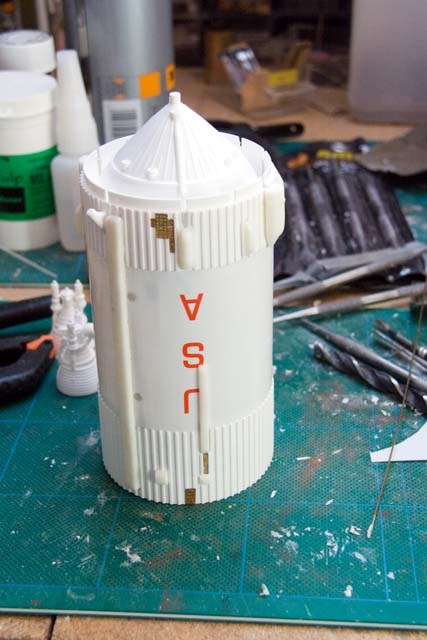 It is possible that this was not something common to all Saturn V’s (remembering that the one on display at KSC is the test one, but this is also the one that the kit is really based upon). But looks like I have some additional wiring to do to the base, which I will do once painting is finished. I haven’t upto now touched any of the interstage parts but they looked like pretty easy components and I thought I would tick them off my list. The interstage between the first and second stage is the piece below. 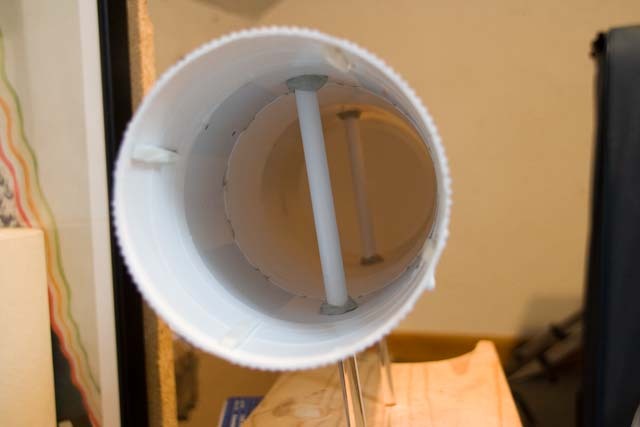 The additional parts which allow you to make a stack where trimmed away first. Unfortunately because Revell did base their model on the test version this had 8 ullage thrusters, but flown versions only had 4 (and later ones had none). This means trimming off every other one of the mounting points that have been moulded in. The New Ware resin thrusters fit nicely onto the stage. The second of the interstages I decided to tick off was the one between second and third stages. This just has four little “modules”. There isn’t honestly really a lot of difference between the Revell ones and the New Ware ones but as I have them I replaced the kit ones. Original is on the left and new one on the right. Final for this update is moving onto the third stage. I had originally planned to replace the wrap with a new piece of stock sheet, but I didn’t have anything the right thickness, so went with the kit one. The reason to replace it was because it had got a bit damaged at one end. Bit worked out OK and nothing a bit of filler wont fix. Quite a bit of resin and photoetch on this stage, which will start on next. Some great progress over the Easter holidays. The tubes are held securely in place with some Magic Sculpt. The final version wont be leaning like this one is. This was just in a scrap of wood so I could ensure I got the angles inside the stage correct. 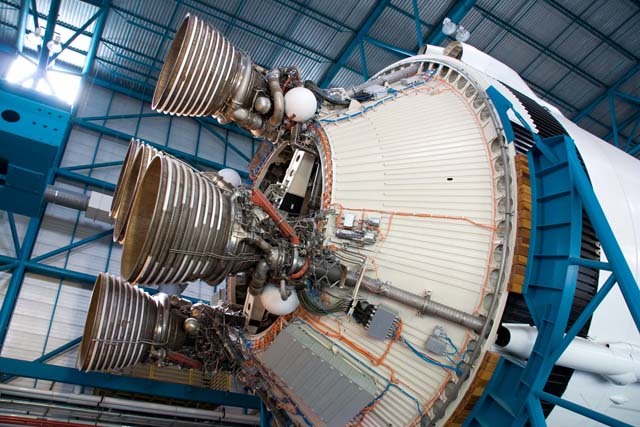 Pretty much the only remaining aspect of the build for the first stage are the F1 engines. The inside of these have some hollow areas (where the parts for the turbos go around the outside) and clearly the originals are enclosed. So a bit of filling is required. Here is one which is done and one which has those hollows. The hollow was filled with some Magic Sculpt. A spray with primer revealed some bits that need some sanding and extra filling, but not bad for a first attempt. And so with the first stage nearing some level of completion, and with the Magic Sculpt drying, I decided to move onto the second stage. The most annoying aspect which I hit first was that the stringers on the bottom of the stage are too long on the original Revell parts. This meant grinding off the excess stringers. The tape was a good guide and actually, although very messy, it didn’t take too long to get them all removed and the surface sanded flat. The next part after that was to install the insulation which goes above the stringers. 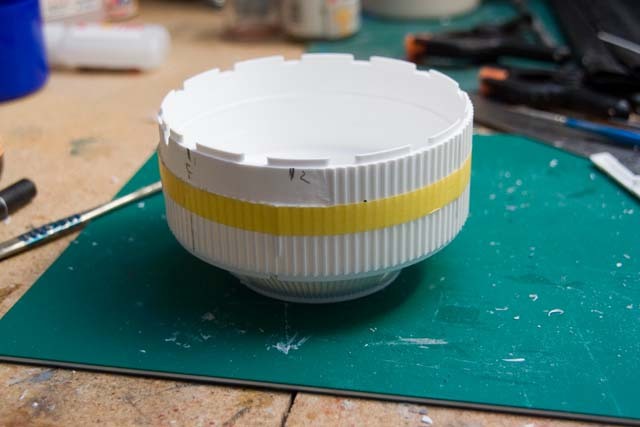 I did this with a loop of sheet styrene cut to the correct height and then further pieces were cut, following the plans in the New Ware instructions. Helpfully these are shown in 1:192 scale, so everything can be doubled to get the 1:96. There are five sections of insulation which project up the stage. 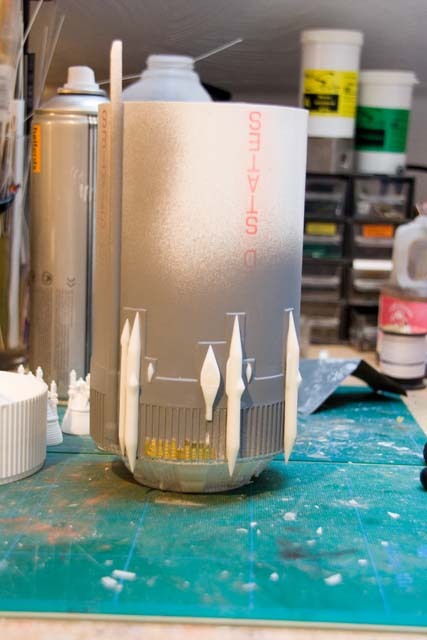 A coat of grey primer revealed the points where the joins showed, and a coat of Mr Dissolved Putty was added to these and sanded down. The final result was pretty reasonable and actually didn’t take as long as I had feared. One of the most time consuming parts was ensuring that all the edges had a 45 degree bevel on them. Oh, and before anyone comments, I do realise that the United States is upside down. 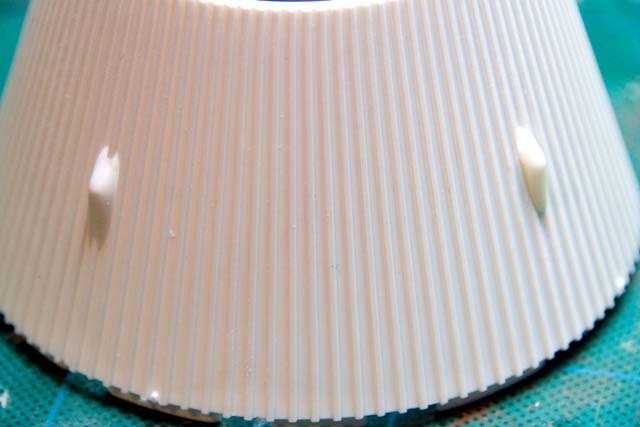 I glued the collar together without comparing to the first stage and which way round I had done that. When I actually looked I had done them the other way round. No big deal as it will all be painted over and new decals added anyway. 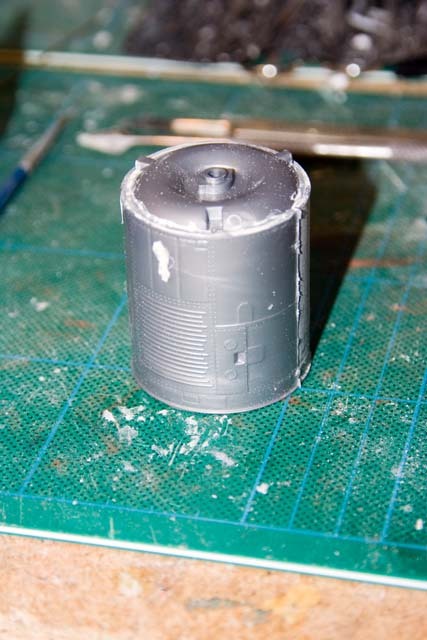 And so I was then in a position to get some of the resin parts onto the stage. There are quite a few of these around the bottom of the stage and after cutting them off their casting stubs they were superglued into place. Working out the positions of them is probably the most time consuming thing. In fact that is pretty much a good description of the whole build. A lot of time is spent deciphering the instructions, working out which way round to put things together and trying to interpret the frankly appalling Revell instructions. The only times I have actually made errors is when I have assumed I knew what I was doing and didn’t check everything ten times. That’s pretty much it for this update. There has been some work on the bottom of the stage, which is very busy, and more on that to come.